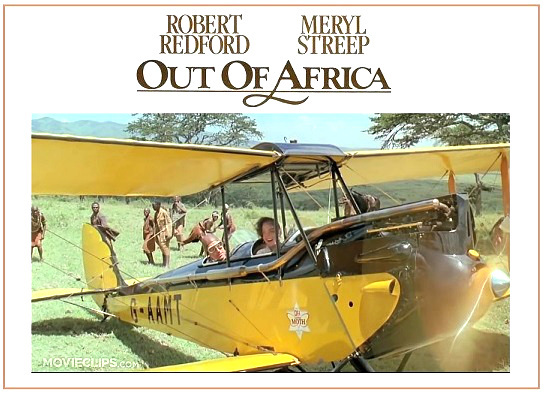 Remember the seven time award-winning movie “Out of Africa” starring Robert Redford and Meryl Streep? 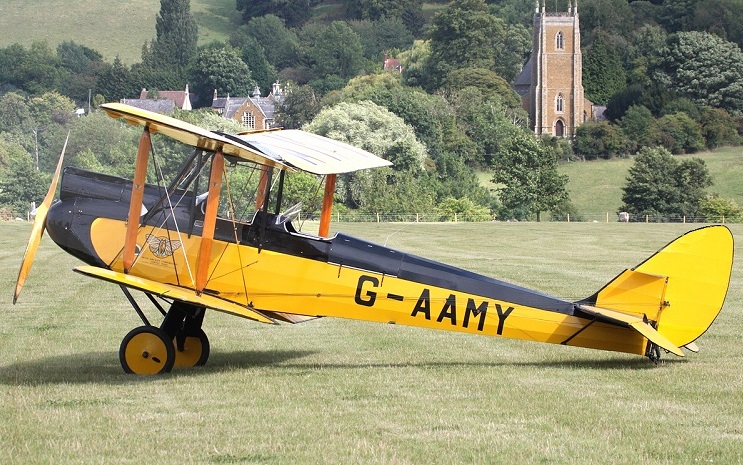 Produced in 1929, this classic aircraft starred in the seven times academy award winning movie “Out of Africa” starring Meryl Streep and Robert Redford. After the movie G-AAMY was sold at a Paris auction for $302,000.00 to Jochen Zeitz, the owner of the Segera retreat and Founder of the Zeitz Foundation, who had dreamed it should return home to Africa. G-AAMY has been given a new lease of life and once again soars over Kenya’s scenic landscapes. This Gipsy Moth sported a 90hp. Wright Gipsey L320 engine which was manufactured in the USA under license. It is also interesting that this particular moth was on flown on a number of occasions by Sir Winston Churchill. Is this a beautifull aeroplane or what?? 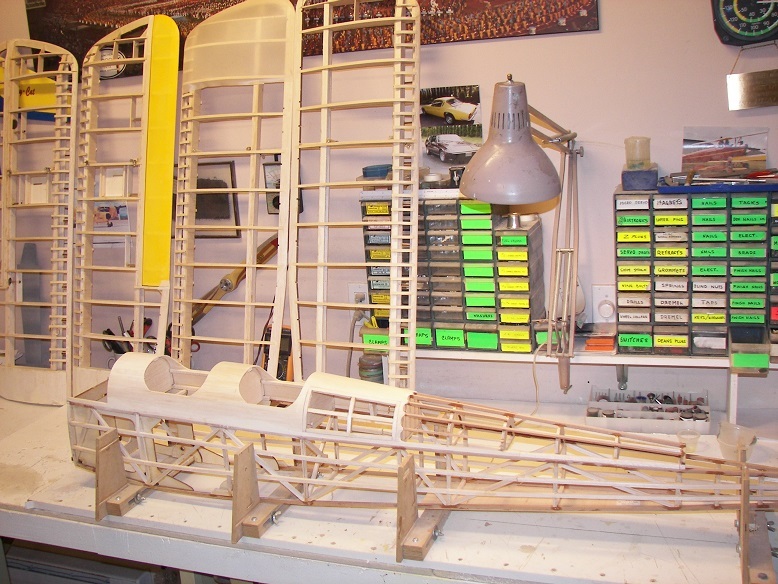 Well this will be a ¼ scale model of that airplane based on plans by Bill Northrop.....the black and yellow G-AAMY . I expect to power it with a Saito 150 on spark ignition. 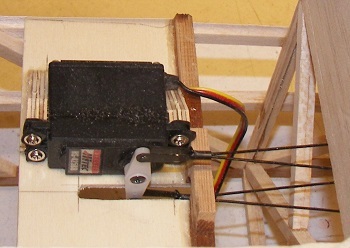 The servo mounting boxes are in place, ready for the aileron servos. 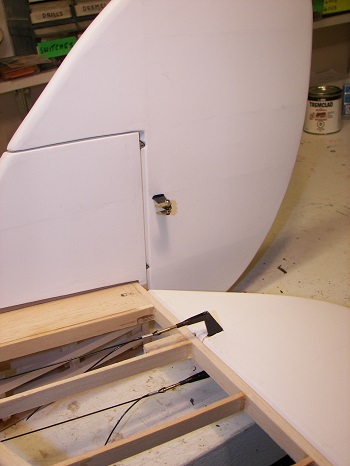 The aileron hinging is temporarily in, the strut mounting fittings are installed and the flying wire attachments are in place. At this point I have tested out the paint on one aileron that has been covered with fabric. It looks like the color will have to be changed to better match the documentation specifications. 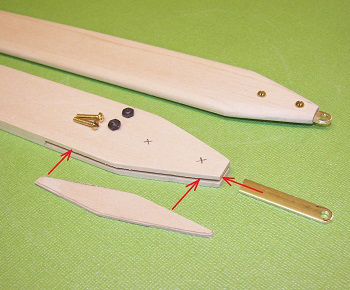 The interplane struts are roughed out.....the brass connector is slipped into a sawcut and screwed in place. 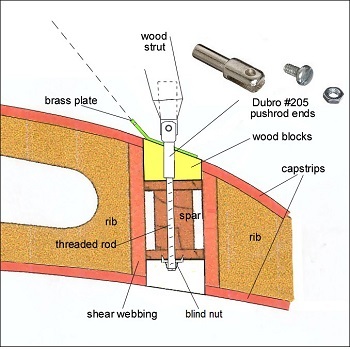 The sawcut is later filled up with a thin wood shim and all epoxied together. 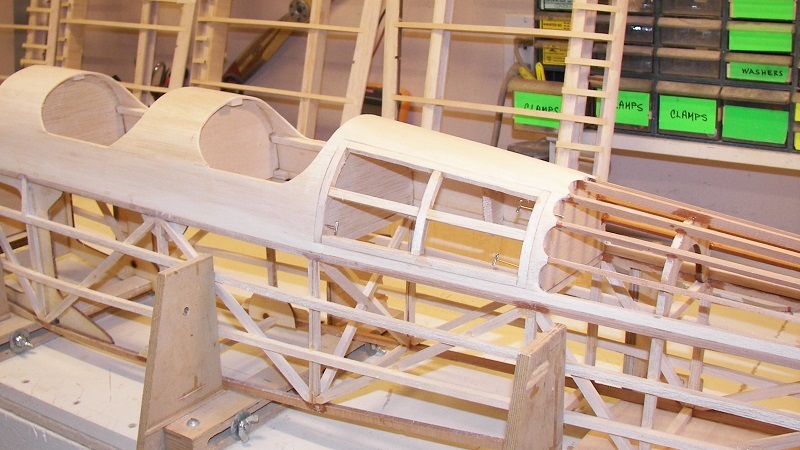 The fuselage is roughed out and is still in the building gig. 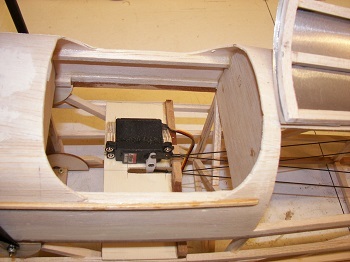 Two stringers have been added to the sides of the fuse to match the newer model which had a tubular metal frame. 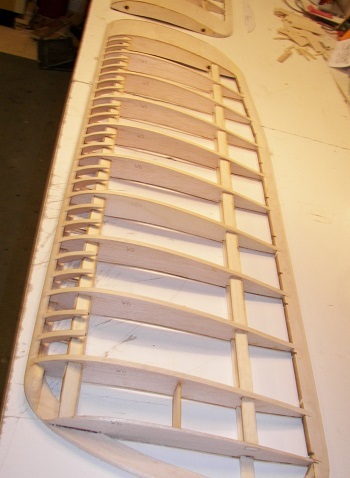 The turtle deck has also been made to match my documentation and a luggage storage hatch is roughed in.....none of this is shown on the plans that I am using .....a lot of innovation here.....I am basically building from the many photographs that I have of the "Out of Africa" Gipsy Moth. Thanks to Robin Van Dorst for these!! The elevators are split but controlled by one servo.....it is a double pull-pull system running through two exit holes in the side of the fuse. 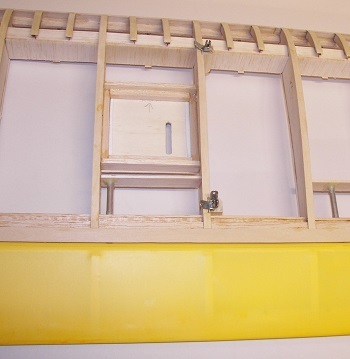 Plastic coated kevlar chord is used for the pull-pulls and will also be used on the wing rigging. The stabilizer is braced on the underside by two pieces of aluminum streamline tubing which have adjustment on one end. All these modifications are taken from close-up photos of the fullsize "Out of Africa" Moth. 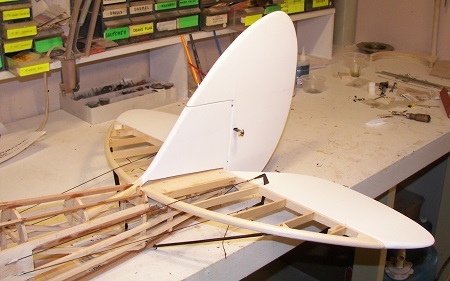 Since the wings will be folding it is necessary to have a temporary strut (a Jury strut) that is placed in the inner forward part of the wings to hold them apart when the wings are folded. These are made of aluminum tubing with a threaded insert to allow for quick tightening of the strut into sockets in the wing. 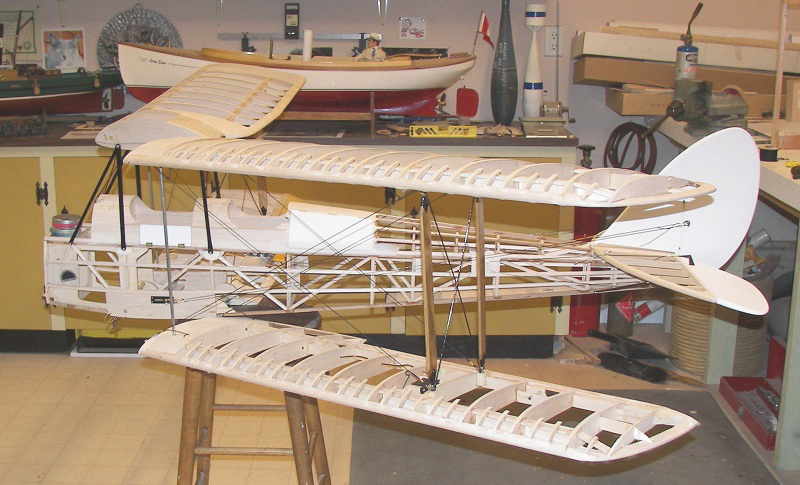 With the wings in place, the rigging wires temporarily installed, the outboard struts and the jury struts in place the folding of the wings can be tested. The wings were fitted and rigged in a building gig to assure that everything lined up properly. With the framing mostly completed I can now start looking at covering and finishing.